Nothing has been truly fixed since the last bailout bonanza at the end of 2008. The banks are still allowed to use phony accounting to appear solvent. There is no public market for over-the-counter (OTC) derivatives market. The Bank of International Settlements says the OTC market is around $600 trillion. (Some say the OTC derivatives market is more than twice that size, yes more than a quadrillion bucks!) Not a single big banker on the planet has gone to jail for wrecking the global economy, and there is still almost zero transparency at the banks. How many problems get better when you ignore them? My guess is that this crisis is, at least, just as bad as the last one. It will take many more trillions of freshly created dollars to get it under control for a second time. The “Core” inflation rate is just shy of 2%, but that excludes fuel and food. The path is unmistakably trending up—way up. If you compute inflation the way the Bureau of Labor Statistics did it in 1980, it would currently be 11.4% (according to Shadowstats.com.) At that rate, the true buying power of your dollars will be cut in half in a little more than 6 years. So, for those of us living in the real world, where you have to eat and drive a car, prices are going up fast. The “official” inflation rate has jumped up to only 3.8%, but even that is not exactly good news. I have to rule out that the inflation we are seeing is due to the economy heating up. I have to rule in, the so-called “recovery” story is a resounding bust! Nearly 46 million people are on food stamps—a new all-time record. Foreclosure notices jumped 33% last week, and unemployment claims are back over 400,000 (428,000) as well. Oh yeah, you also have to factor in we are starting another massive banker bailout, and you don’t do that because times are good. I am no economist, but that data suggests to me there is NO RECOVERY! (This is what I’ve been telling you for months.) There are just trillions of dollars created out of thin air to bail out the bankers that caused the vast and unprecedented financial crisis the world is still struggling to get under control. The Federal Reserve is a PRIVATE corporation, and hence, can do as it pleases. However, what is OBSCENE is forcing the American taxpayers to FUND the Fed in its whacky adventures. All this to keep a few mentally ill old men in power. However, what is even more obscene is that these same banks will tell small businesses that they have NO MONEY – and/or they also require these same small businesses to meet criteria that even Jesus can not fulfill. The result of this selfishness and greed is more and more unemployment, with a growing populace that will sooner, rather than later, bring the national bankruptcy to reality. A reality where the POTUS will be forced to make cuts, and turn many away. All great comments, thank you for making them!! Q. The bankers got us into this mess, so why can’t they get us out of it? A. No bank has acknowledged they got us into this mess. Where there is no responsibility, there can be no repair. A floating currency [U$D] moves up and down based on the demand for dollars.Increase in supply can only decrease value. What we need to do is let the system collapse and contain the damage. If we had done that the first time it would have hurt but we would be on the way to recovery. The bond and stock holders would have taken a big hit and the bankers would not have gotten billions in bonus every year but so what. It would have been better for the people and the country as a whole. VOTE THE BUMS OUT. The newly formed tea party became outraged at the out of control government spending in 2009 leading to a upset for the Democrats. Have people today lost the backbone needed to call government out? Are we numb to the Bernanke helicopter drops of cash for Wall ST., the banksters and now the “too big to fail nations” of the world? In my opinion this apathy by American citizens is even scarier than the harm caused to our economy by our elected officals. Greg, hello again. I certainly thank websites such as USAwatchdog and shadowstats.com for their excellent coverage of the ongoing crisis which is treated as a non-event by the general media. I suppose one can say ‘forewarned is forearmed’. However, I believe we should be devoting some space on forums such as this to an even more important topic, with which I will kickstart this discussion. And that is, my fellow citizens — WHAT DO WE DO ABOUT IT? What do we do with our families, our investments, our general way of life. On, and on. I will ante up with my best shot at what to do with our investment portfolios, since I have spent literally years reading up on this topic. The real answer is I suppose in a nutshell — STAY away from paper assets, own REAL assets. There is more to this than just gold and silver. Most people don’t realize how much they need to earn just to stay EVEN in a heavy-handed taxation and inflation environment. If your tax bracket is 40% (say 28% Federal, 5% state and 7% FICA) and inflation is just 10%, you need to earn 17% annually in order to break even in real terms. Why how can that be, you may ask? It is what the taxman takes, and more importantly, its the hidden INFLATION tax, which will become worse and undoubtedly impoverish us all. The only good news there is, if you own gold or silver and it grows at a 20% annual rate, you will earn a meager 2% after tax and after inflation. Not much indeed, especially since we never know when the paper mafia will stage their periodic smackdowns on commodities in the name of curbing ‘speculation’ or some other such rubbish. And total taxes are not going down for the common worker, no matter what our president says. I invite discussion in this forum as to what else to DO about these things. Thank you again, Greg. Let the discussion begin. Good idea. Thank you. On a positive note, Ron Paul won the 2012 GOP California straw poll this weekend. Not that you’ll hear it on the news, however. Greg, no one out there in the MSM believes it, that is, what your article premise is: Printing and flooding dump trucks of paper money will hurt our economy and could cause hyperinflation. The average american doesn’t know about it and the media seems immune to the idea, either as a news story or that it has any truth to it. The politicians, excepting one or two (like Ron Paul) aren’t discussing it, and I bet although I don’t know, the average person in Europe is not that aware of it either. Maybe the printing has been going on so long now that its seems normal, who knows, but I wouldn’t bet the farm that anything will change unless we do have a catastrophic depression with hyperinflation leading the way. Basically Greg, the simple truth is that with all your good work, and the others as well such as Shadowstats, etc., nothing will change until we are over the cliff letting economic gravity take control of the events. Frankly, its mind boggling and I don’t understand it, but that is where we are. You can expect the people who benefit from the money printing to keep quiet about it, but why in the world does our media stay out of this great debate? There has to be a reason, it can’t be just random. It must be that MSM doesn’t believe printing buckets of money doesn’t cause any future economic concern. Your thoughts on why the media is not in this debate is welcomed. It is sad how in the dark folks are, but it will not stay that way. The monetary problem will surface in spades and then look out. 1) All debts are paid, always. If not by the lender, then by the creditor. 2) There are no means of preventing the final collapse of a boom brought about by credit expansion. The only alternatives are whether this will occur sooner (by stopping the credit expansion and leading to a depression) or later (by printing money and causing a collapse of the currency). If the Federal Reserve is doing all of this bailing out, I would like to know how much interest the US taxpayers will be paying to the Federal Reserve to bailout foreign countries. I don’t think alot of people realize how the Federal Reserve works and that it is privately owned. Every time Ben gets his printing press going, the taxpayers are paying more in interest to the Fed; therefore to the people who own the Fed. If this Congress is so concerned about the federal deficit, maybe it’s time to get rid of the Fed. As long as the Fed is there, we will never be out of debt. Thank you for keeping us updated on what’s going on around this world of financial and political chaos. During last weekend, there were hundreds of people demonstrated in Wall Street. The demonstration aimed “to get President Barack Obama to establish a commission to end the influence money has over our representatives in Washington,”… I am sure that the protestors will be disappointed. President Obama, like most (if not all) politicians in Washington, also takes money from Wall Street. Where do you think he gets most of his election money? The unemployed worker, the foreclosed homeowner, or may be the homeless guy in the street? As long as it is legal to take money from their lobbyists, the representatives in Washington are happy to serve the big banks and big corporations. It is about time for more people to realize that the representatives in Washington are not public servant – they are private servants for special interest groups. Their famous motto is “To protect and to serve” the people with biggest contributions. A friend of mine that lives in Brooklyn says it was really thousands and they were chanting something like “The banks got bailed out and we got sold out.” The remarkable thing is how little coverage this got in the local and national media. Russia Today covered it and what a shame that Americans can get better coverage from a communist country than our own so-called free media. Thank you for your contribution on this important subject!! Thanks for more sobering news on what the criminal Keynesian bankers are “still” doing Greg. They are insane, but their next moves seem to be easily predictable at this point. Everyone should now be able to position themselves accordingly for the coming economic collapse. I look at my asset and investment portfolio that includes lots of gold and silver. I have no debt. I own my solar, wind power renewable energy home. My vehicles are also electric and I charge them at home. I have farm land, heirloom organic seeds and plenty of guns and ammo. I hunt for elk, whitetail deer and game birds. We have great trout fishing as well. I know I am blessed. The only reason I have all this is because I listen to people like Greg Hunter, Ron Paul, Peter Schiff, Judge Andrew Napalitano, Lew Rockwell, etc. I hope everyone that reads Greg’s column will do what is necessary to protect themselves. Head his words, buy gold and silver. It will be enormously valuable when the crash comes. They gotta pay for all that worthless paper money debt somehow! Trillions of dollars of it. Plant a garden if you can. Get rid of most of the paper money, keep only what you need to get by in the short term. 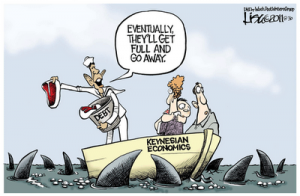 I may be alarmist, but I think it’s time for everyone to wake up and win the war against the Keynesians. It’s time for everyone of us to get the spirit of our patriot forefathers and fight for our country, or we will lose it. Ron Paul 2012. Thank you Jerry for your comments and support. 1) Bernanke (with the push of a button) electronically creates billions of dolllars. 2) He then sells these dollars to willing buyers? e.g. the Chinese, Saudi’s,Japanese, etc. 3)The Chinese buy them with hopes that they’ll be paid back with interest? Why not just skip step two and simply give the money directly to the banks? China said, paper are a new electric car factory. China said paper are boat loads of logs. The world is growing just not in the G5, fake banking paper pusher countries. The world is better off without Wallstreet,DC and Pentagon. Some people say the new patent law , is part of the Pentagon plan to release the long held secrets that will leap the world ,100 years forward. Yes we have a trillion dollar space station and no way to get there, lol. This space station is a ship because it can move under it’s own power. The war of the DC insider must be a very strange world. I just hope I live to see the true history of the last 100 years. I have no idea why anyone would want to be President over the collapse of the USA, it seems ineventable and would probably taint that party for a verrrrrry long time. Todays drop in PMs are being touted as profit taking but I think most of us know what’s really going on. Massive paper selling to shake out weak hands. Both on-target sharp comments! Thanks men!!! My only question here is where are all the dollars being “hidden”. All this created money does not seem to be actaully expanding the money supply in a real way yet……..although I am sure it will at some point. When these dollars are created where exactly are they ending up? Are they simply staying on the books they are balancing, or are they worming their way slowly but surely into the money supply watering down the currency each time they are spent deeper into the ecomomy. If the money is contained why the heck create it? Just to make a bank look solid? Is it merely some attempt to modify the publics outlook on reality so the game can grind on………….kind of like how they medicate the crap out of our troops so they can function in a war zone for a fourth or fifth time…….. The insidious thing about fiat money or counterfeit money is that it is worth face value to the guy who spends it first, its value slips every time it is spent after that. appendage; the FED and Bernanke does not believe that the money pumping will create “uncontrolable” inflation. Bernanke’s plan for the Japanese stagflation indicates that the FED/central bank can create inflation with money pumping to stimulate an economy. This is a flawed theroy because it does not create real wealth for people but it only inflates money and it is a psy-op to make people think they are richer… so people will spend money and stimulate an ecomony. … Bernanke’s paper on Japanese Stagflation given to the Kanas FED is a great read for insight into the mind of an economists economic theroy. Thank you for a really informative and educational post (again). I have a question for all members – if the dollars continue to flood the system, what will ever cause the ridiculous bond market bubble to ever blow up? The Fed has said the rates are at this level for the next 2 years. More printing is lower rates which leads to higher prices on the bonds themselves. Eventually, that has to give, doesn’t it? Or does the word bubble not apply to the bond market? Can anyone explain to me please? I ask everyone I know and no one disagrees with me, but can’t give me an alternative answer that explains what is going on. The European bankers recognized the level of incompetence Geitner brings to the table. So why would they listen to him? As far as listening to anyone regarding insolvency, why would they listen to the United States who is also insolvent? Providing more trillion dollar handouts is the normal business today. You know… those bankers need to get their million dollar bonus checks. Also this allows them to steal more from future generations. The whole lot should be incarcerated for life, and/or hung by ropes made of money. A published, core inflation rate of 2% is a joke and outright lie; even the 1980 rate calculation of 11.4% is not high enough. In 1967 I supported a family of 5 on $2.18 per hour. I believe it would be very difficult to support one person on $87.20 per week ($4,534.40 annually) today. Now that’s the Real Inflation factor! I cannot believe that anyone believes there is a “recovery” in progress. If so, they work for the Obama administration. If a recovery was in progress, why would the EU need to be bailed out? Also, why does the U.S. have to bail out foreign banks? Answer: the bankers are bailing themselves out of insolvency at the expense of the public! The Federal Reserve is a “Private Bank” with authority to print money. Hyperinflation is just around the corner. Can you say 2012! Thank you Charles, Frank and M Smith. One question remains. Why are these criminals still walking around free? They have deliberately engaged in conduct that threatens not only the U.S. economy but the very survival of the American nation. They literally pose a greater threat to the lives and futures of our children and grand children than would a rabid dog in your front yard or a cobra in the nursery. Why is the American public supinely tolerating this? Greg, I just watched Obama’s speech, nothing has changed, he is determined to destroy the middle class & screw every one out of their pensions period. Watch as congress adds this Chained CPI to those who rely on their social security raises to keep up with the higher cost of every thing they need to live on! Here a great article I read yesterday. http://news.goldseek.com/InternationalForecaster/1316361600.php. Bob gives a great view of just how bad these policies are, what these political hacks are up to, which is no good. These politicians will use the wording ‘Do as I say’ Not as I do’ and it high time they hear that we will find the truth because the MSM is no longer where we look to find the truth. We the people have no say in what goes in DC, only the Unions, special interest groups and investment bankers. Greg, now that some names have been exposed to the suites that JPM has against it, what do you think will come of this & will the MSM give it any air time? I would like to hear your views & others on this subject. Most Americans have no clue about ‘Chain CPI Is’ would you do a story on it? What it does to Americans who rely on Social Security to live on? There is no coverage by the MSM & I afraid it will go under the radar until some one like you does a true story on how Americans are being lied to by their own members of congress. It seems they want to keep this off the minds of the millions it will have a grave effect on! I want to thank you for your stand fast reporting of the truth. When all the kings men fall down the rat’s hole, I feel you will be on top when all the rest of the MSM are exposed for their part of hiding the truth from Americans for the power elite. It seems like Brian and I have the same questions about the Fed. If the Fed didn’t exist, the large banks that took crazy risks would have gone bankrupt, but the rest of us would have continued on with our lives. All the government would have had to do was pay out the FDIC mandated $100,000 dollars and after that, everyone would be on their own to sink or swim. Who told Bernanke the banks needed to be saved? I read your link associated with “Government Accountability Office (GAO) compliments of a little provision Senator Bernie Sanders tagged on to last year’s Wall Street reform bill”. That was an amazing set of statistics showing that funds were funneled to many foreign institutions. Are U.S. citizens on the hook to pay this back to the FED? How can that be? It would be sensible to push all this back onto the FED to pay back. Why not since they doled out the $16 trillion? This is how much totally out of wack things are. Protect youself. Chile in 1974 after the coup d’etat by Pinochet, which saved them from being another Cuba and it was still 700% inflation. I’ve seen it and we are on the verge of seeing the same thing happen here. It can happen suddenly. Stock up on tangible goods! Yours is one of my favorite sites for honest information. Thanks! Great story! I think it’s spot on. Central banking, fractional reserve lending, and fiat currency are all assaults on property, and thus, on liberty itself. People of the various states must DECLARE THIER INDEPENDECE from the fedguv & the banks that own it. Only by living in a new nation that respects Rule of Law (which by it’s very nature disallows central banking, fractional reserve lending, and fiat currency) can people enjoy thier God given rights of Life, Liberty, and PROPERTY. Food storage should be on the top of your list here for preparing for the inevitable drop in our economy. I have build a safe-room in my home behind a false wall to hide non non-perishable foods so that even if we get raided we will have stocks. People talk about us like we’re from another planet when we speak about things to come. How can people have so much faith in a system to save them when that same system condemned in the first place. It is better to be prepared and be proven a fool for doing so than to starve to death believing the foolishness going on right now. I’ll be a fool for my loved ones all day long. Even if you are proven wrong, which you will not be, stored food is an excellent investment. Food is not going out of style any time soon. The food you purchase in the future will be way more expensive than the food you have squirrelled away now. It is an insurance policy. When you buy car insurance you don’t go out and have a wreck just so you can collect back the premiums paid. You derive the benefit by having been financially and medically protected. If you collect on your stored food insurance the payback is survival. Keep sharing and you may be instrumental in helping someone else avert starvation. Adolph Hitler said that food is “a beautiful instrument…for maneuvering and disciplining the masses.” Food has been used as a weapon of war for centuries. Preparation keeps these creatures at bay.